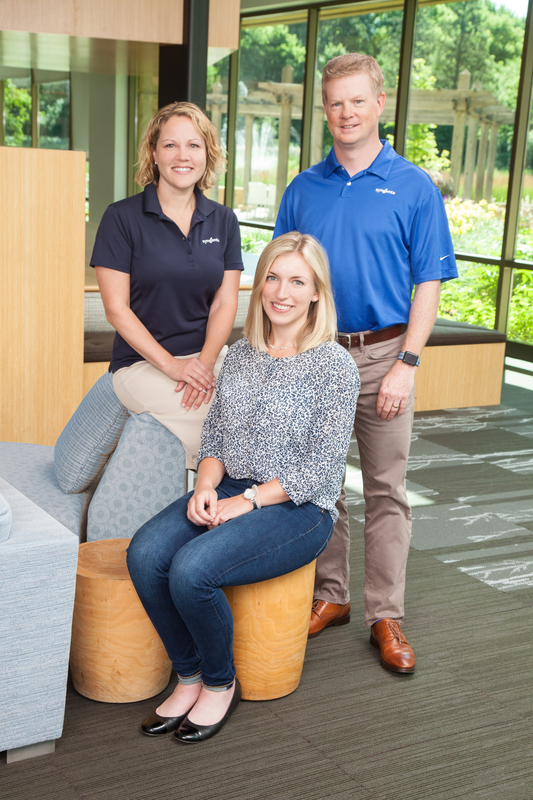 Left to right: Jenny Heaton, Lisa Schmid and Colin Steen relax for a moment at Syngenta Seeds, Inc. in Minnetonka, Minnesota. Lisa Schmid checks out a Syngenta field day in Stanton, Minnesota..
Greensboro, N.C., Oct. 9, 2018 – Job shadowing has been around for many years, but adding an international component is a new twist on a tried-and-true way to learn. The new addition to the IFYE Association of the USA, Inc. (formerly International Farm Youth Exchange) program adds the opportunity not only to live with a host family, but to job shadow professionally with a member of the family as well. A pilot program implemented by global agri-business leader Syngenta recently ended a successful exchange with Lisa Schmid, an IFYE from Germany. She job shadowed and lived with three Syngenta professionals who work at the company’s Minnetonka, Minnesota, location. “I was able to learn about other aspects of agriculture while with my Syngenta hosts. It was an amazing adventure that I’ll always remember,” said Schmid. It was also a worthwhile experience for Syngenta. “I hoped to pilot the program in a way that we can replicate, so we can start thinking differently about introducing Syngenta opportunities to youth earlier—before they make major career-related decisions,” said Jenny Heaton, head of people and organization development, North America and Global Seeds, Syngenta. The next step for Syngenta and IFYE is to implement the opportunity for U.S. IFYEs to job shadow in other countries where Syngenta has major operations. “We look forward to growing this relationship and working with Syngenta to offer our participants new experiences that continue to add value to the exchange program,” said Ken Gordon, executive director, IFYE. For more insights and news from Syngenta, visit www.SyngentaThrive.com. For more information on the IFYE Association and how to get involved visit www.ifyeusa.org. Join the conversation online – connect with us at Syngenta-us.com/social. Founded in 1948, the IFYE Association of the USA, Inc. provides cultural exchange programming that places participants with multiple host families during a three- or six-month period in one or more of 15-plus countries. IFYE representatives experience a once-in-a-lifetime opportunity to gain an understanding of the culture and lifestyle from those they live with while in the program. IFYE exchanges are conducted in collaboration with country coordinators and programs are facilitated and supported by the IFYE Association of the USA, Inc. The IFYE vision of “Peace through Understanding” continues to touch the lives of people around the world. ©2018 410 Swing Road, Greensboro, N.C. 27409. The Syngenta logo is a registered trademark of a Syngenta Group Company. All other trademarks are the property of their respective owners.